1-2 Clathrocircus stapedius Haeckel; 1, apical view of specimen with latticed cephalis, VS-R-151a, 1-3cm, M41/0, 300x; 2, ventral view of specimen with latticed cephalis, VS-R-151a, 1-3cm, R38/2, 300x. 3-6 Pseudocubus obeliscus Haeckel; 3, apical view, focus on upper ring, VS-R-151b, 1-3cm, H53/4, 300x; 4, basal view, focus on collar ring and basal tripodium, VS-R-133b, 1-3cm, E43/0, 300x; 5, side view of test, VS-R-133b, 1-3cm, C22/4, 300x; 6, left lateral view, VS-R-133b, 1-3cm, C28/1, 300x. 7-10 Tristylospyris scaphipes Haeckel; 7, dorsal view, VS-R-81a, 1-3cm, E19/3, 300x; 8, dorsal view, VS-R-71a, 1-3cm, B7/3, 300x; 9, ventral view, right lateral leg broken, VS-R-27b, 1-3cm, P37/3, 300x; 10, ventral view, lattice developed between legs, VS-R-92b, 1-3cm, F28/1, 300x. 11-14 Petalospyris cf. ophirensis Ehrenberg; 11, dorsal view, VS-R92b, 1-3cm, D21/0, 300x; 12, dorsal view, VS-R-71a, 1-3cm, R36/1, 300x; 13, basal view illustrating one of the ventrally extending, nearly horizontal spines originating from the left latero-ventral corner of the collar ring, VS-R-92b, 1-3cm, U35/3, 300x; 14, ventral view, VS-R-71a, 1-3cm, N11/4, 300x. 15-18 Ceratospyris polygona Haeckel; 15, dorsal view, VS-R-92a, 1-3cm, E30/3, 300x; 16, apical view, VS-R-56b, 1-3cm, W39/0, 300x; 17, ventral view of specimen with large circular pores, VS-R-60b, 3-5cm, S53/1, 300x; 18, ventral view of specimen with small pored lateral lattice, VS-R-81a, 1-3cm, Q55/4, 300x. 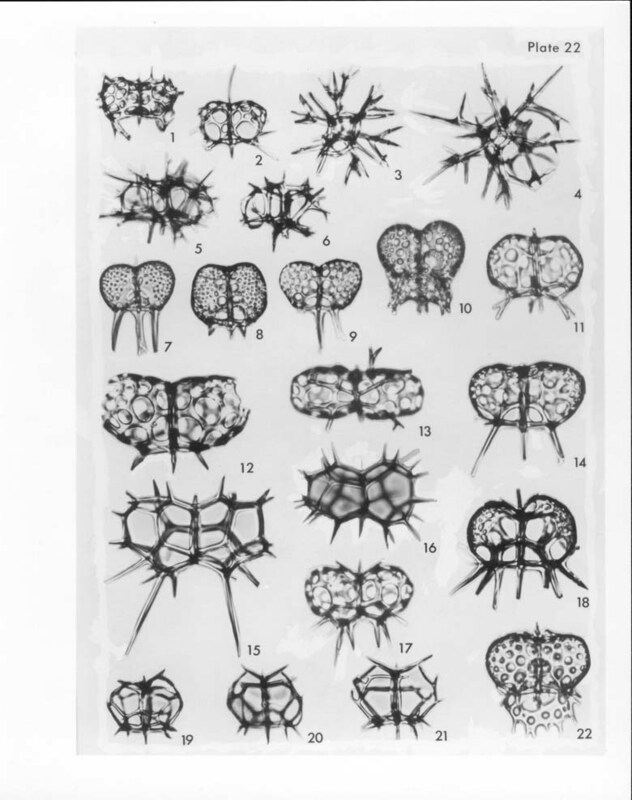 19-21 Ceratospyris cf. pentagona Ehrenberg; 19, ventral view, VS-R-133b, l-3cm, H37/2, 300x; 20, dorsal view, VS-R-133b, 1-3cm, F27/0, 300x; 21, dorsal view, VS-R-133a, 1-3cm, H34/1, 300x. 22 Patagospyris ? sp. ; ventral view, VS-R-92b, 1-3cm, Y31/0, 300x.